My last blog post was too long to explain performance regressions for range scans with InnoDB in MySQL 5.7. For a secondary index a non-covering scan degrades much more at high-concurrency than a covering scan. The problem gets worse as the scan length increases. This problem isn't new in 5.7 but it is much worse in 5.7 versus 5.6. At 32 threads the problem is waits on btr_search_latch and hash_table_locks. I opened bug 74283 for this. 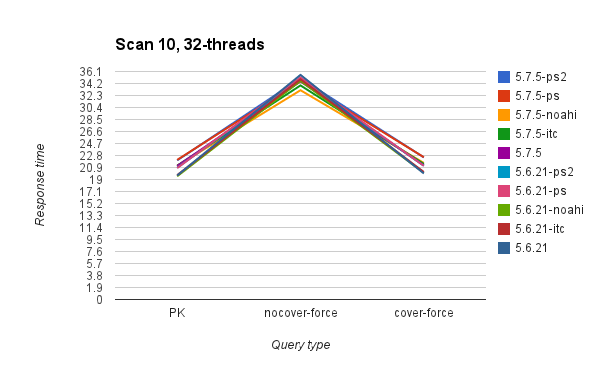 A covering scan of a secondary index degrades much more at high-concurrency than a PK scan. This problem is equally bad in 5.7 and 5.6. Wait times reported by the performance schema do not explain the problem -- search below for PFS_NOT_INSTRUMENTED to understand why. 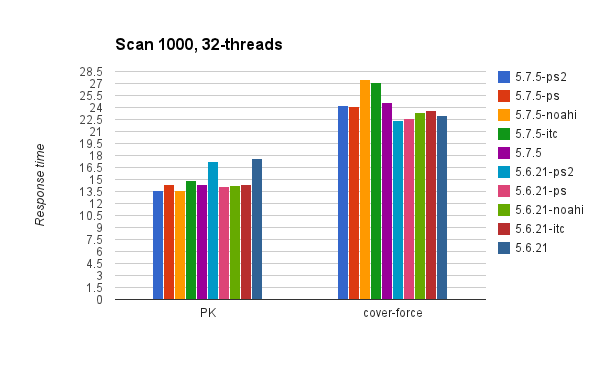 Using Linux perf I definitely see more mutex contention in the covering index scan. But I don't understand the internal differences between PK and covering secondary index scans. I opened bug 74280 for this. These graphs show the absolute response time in seconds, not the normalized response time as used in my previous posts. 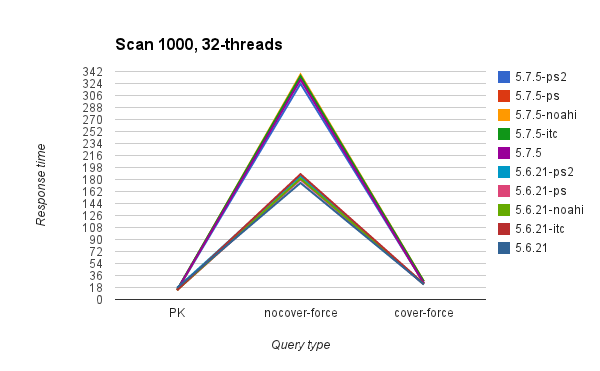 The response time difference between non-covering and covering secondary index scans is much larger at high-concurrency than at low-concurrency. For the 10-row scan the non-covering index is close to the covering index response time at 1 thread but at 32 threads it is almost 2X worse. 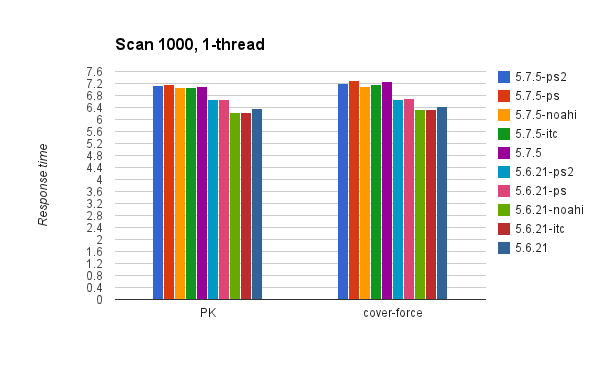 For the 1000-row scan the non-covering index is about 2X worse at 1 thread and then at 32 threads is about 8X worse in 5.6 and about 13X worse in 5.7. From the PS data that follows the problem is much more wait time on btr_search_latch and hash_table_locks. 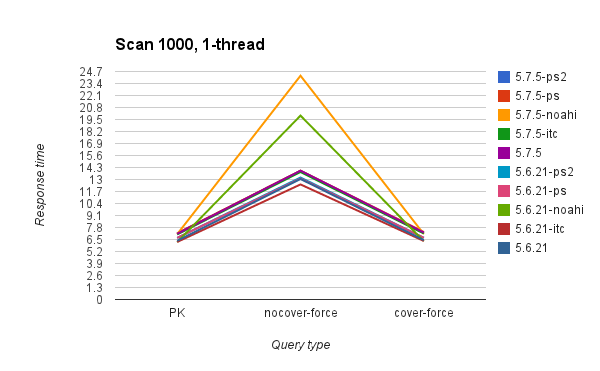 These graphs show absolute response time for the 1000-row scan using MySQL 5.6 and 5.7. 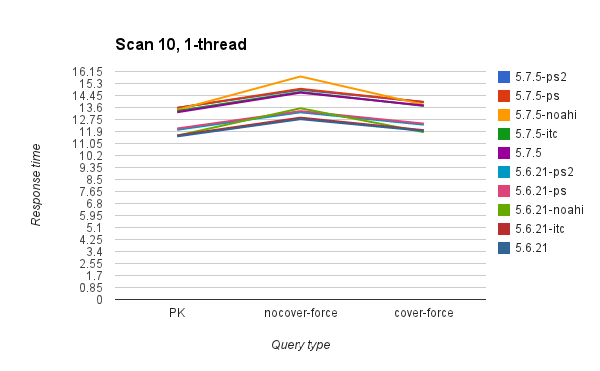 There is not much difference in response time between the PK and covering secondary index scans at 1 thread. There is a big difference at 32 threads. Assuming the problem is mutex contention then we have to perfect tool to diagnose the problem -- the Performance Schema. I enabled it to instrument wait/synch/% objects and the results are interesting. I ran the scan tests at 32 threads for the q1, q4 and q5 range scans (q1 is PK, q4 is non-covering secondary, q5 is covering secondary). Tests were done for 10-row and 1000-row scans with the adaptive hash enabled and then disabled. For each configuration the top-10 wait events are listed below. Note that the q4 query runs for much more time than both q1 and q5 and that q5 runs for about 2X longer than q1. I have not normalized the wait times to account for that. This is the base case. It was about as fast as the covering index scan. This is the base case. It was about as fast as the covering index scan whether or not the adaptive hash index was enabled. The waits here are similar to the PK scan. This is about 2X slower than the PK scan at 1000 rows. The waits here are about the same as the PK case but the top wait event, hash_table_locks, is less here than in the PK scan. There isn't a wait event that explains the difference in performance. Perhaps the difference comes from CPU instructions or cache misses. And this is from the covering index scan. For the secondary index scan the top two CPU consumers are the mutex busy wait loop. So there is mutex contention that isn't reported by the performance schema.